Just like with previous makes, I sewed up a size 12 dress in view A with cap sleeves. I did no further changes to the fit aside from what I did last time as I had marked those changes to the pattern already. The fabric is a fun cotton with owl and mushroom print, it's such a fun fabric, how can I not love it? I overlocked all the raw seam allowances to prevent fraying and used a rolled hem for the sleeves and skirt. I skipped the belt and pockets as I was in a bit of a hurry to finish the dress. I mean it's perfectly normal to decide the dress you want to wear in the evening isn't even cut out yet, right? Good thing I can sew fast, otherwise I'd be tucked in to the loony bin ages ago. Oh my God. Here I was thinking the post went up on Friday. Guess who forgot to press "Publish?" Yikes. Heya. This post is about a match made in sewing heaven. A button up shirt called Archer and jeans called Ginger. These two are making a frequent appearance in my outfit rotation and let me tell you more about them. 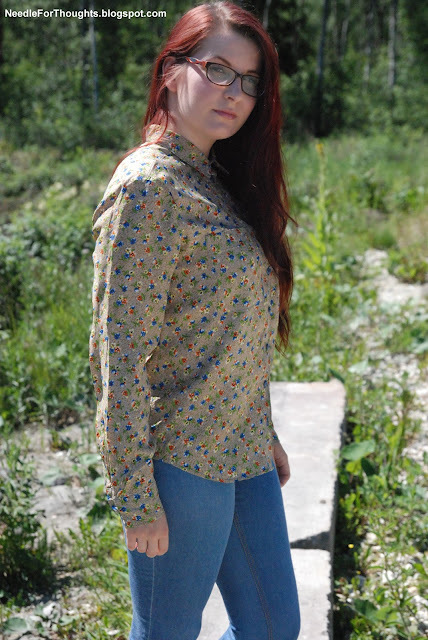 The shirt pattern is the Archer Button Up shirt from Grainline Patterns. For my version I sewed up View A in size 10 in the bust and 8 in the waist and hips. As this is a wearable muslin, I picked a vintage rayon fabric I wasn't too sure about whether I'd like on me or not so if it did end up not fitting me at all, I wouldn't end up wasting a fabric I loved. In the end the fit was pretty good and I love the fabric on me. For my next version I'll need to shorten the shoulders by 1cm and work on the fit of the sleeves. The issue I have with these sleeves is mainly the width. They are just simply too wide especially at the cuffs. And I'd like to have the sleeves a tad shorter as well. However these aren't issues that bother me enough to take the sleeves apart, just something I'd need to fix on the pattern so the next time I make an Archer, it'll fit me perfectly. 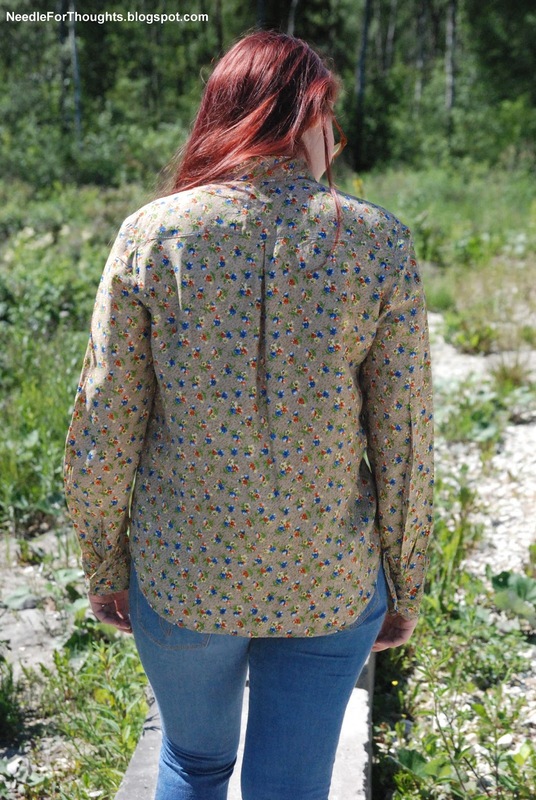 I finished the raw edges with my trusted overlocker and hemmed the shirt with rolled hem. And I decided to use a cornflower blue thread for topstitching just because I can. And it matched perfectly with the blue flowers in the print and also with the blue buttons I chose for the shirt. The fabric is a simple blue denim I found in the remnant bin and has just enough stretch to be comfortable. Unfortunately it is very prone to pilling and I need to clean up the pills after every two or so washes. And don't forget! 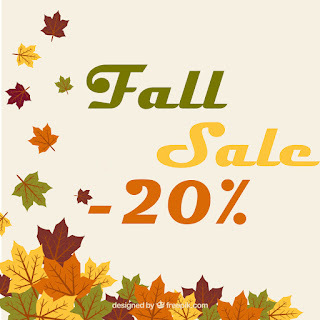 You have until the end of September (01.10.2016 00.00 GMT+3) to get your items from my shop with a 20% discount! Heya. 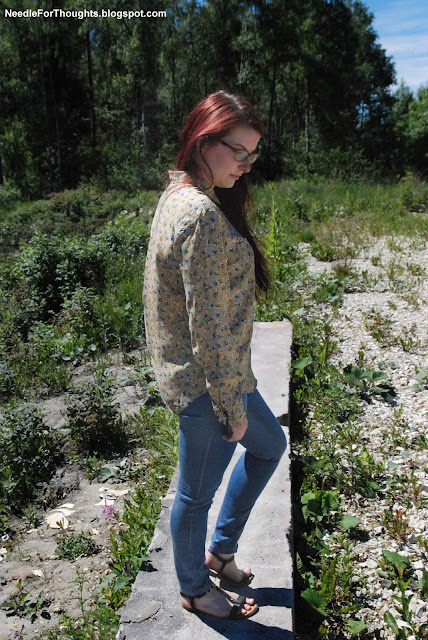 I've got a post about a pair of jeans and a button front shirt coming up tomorrow. Meanwhile I'd like to give you a heads up about a sale happening in my Etsy shop RSKS Creations. Everything is 20% off until the end of September, so it's time to shop-shop-shop! That moment when someone in your family is getting married and it's taking up all your time after you just got your blogging groove back. Whoops. But I'm back again with another self drafted dress. After this post I'll be returning to showing you things I've made with other's patterns. This is the Amy dress which is a nice summer dress with a cotton lining and linen fashion fabric which has pale blue stripes. I had to attend a nautical themed party and instantly thought about a dress made from blue-white striped fabric. And to my luck I found the perfect fabric which had the stripes running lengthwise which is quite rare in the shops in my area. As horizontal stripes make me look shorter and wider than I actually am, finding this fabric was like winning the jackpot on the lottery. For the bodice I used my own bodice block which I drafted last year. The skirt is a 3/4 circle skirt and has pockets in the side seams. The lining skirt is a half circle skirt. I left the bodice seam allowances raw as I stitched the waist seams of the main layer and lining together and there should be minimal fray. The skirt seams are finished with the serger and both of the hems are rolled. The dress fastens with an invisible zipper in the left side seam. 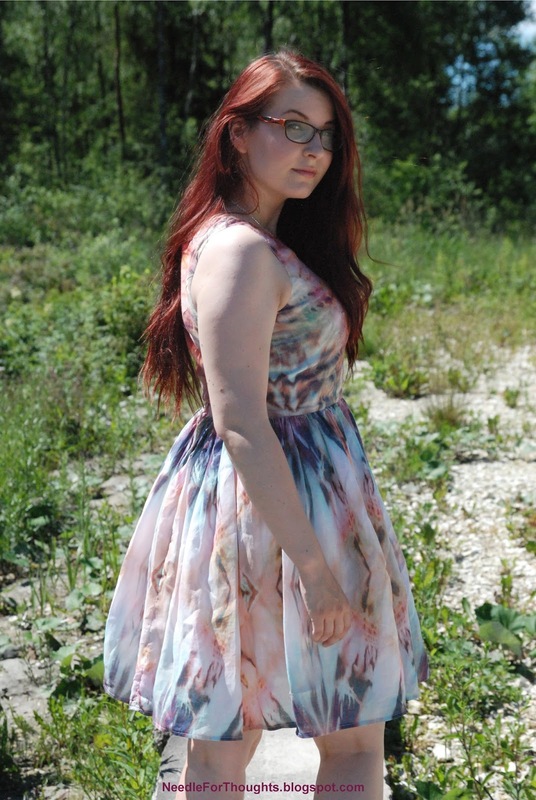 The weather today is absolutely horrible, so I'm going to look at photos taken on a nice summer day and talk about a pretty dress. Maybe it'll make the weatherman feel guilty and make the weather nice again? This is the Hailey dress. Made from my bodice block(which I also used for this dress). The fabric is a lovely lightweight linen and cotton blend that I bought with the idea of a simple dress. And finally it became what it was destined for - a dress with a fitted bodice and gathered skirt. The bodice is lined with a light cream cotton fabric. The raw seam allowances of the skirt are serged and the hem is also serged and then turned back and stitched down. The dress fastens with an invisible zipper in the center back. I love this dress so much. It's one of my most worn pieces of the summer and I am no where near being done with it. The only downside of Hailey is that the fabric is so light that it flows a bit too much in the wind and I've had a few incidents where I've gotten VERY close to pulling a Monroe. Maybe I should sew a strip of lace to the hemline to weigh it down? Hey look I'm over my writer's block after a few months of being super busy in the studio. This is my first Hawthorn dress, but not my first Hawthorn rodeo. This time I kept it super simple with no sleeves or collar(aka I didn't have enough fabric. If someone writes this to my tombstone, I won't mind). It's a size 10 bodice with the changes I made to my Reversible Hawthorn Blouse. The skirt portion is a simple rectangular piece that's gathered in the waist. The fabric is a vintage cotton which I scored from an online auction ages ago but like most fabrics I own, it simply traveled to the stash to wait for its turn. I'm happy I chose the Hawthorn for this one. The seams are finished with the serger, the hem is overlocked and turned back once and stitched down. The armholes are bias bound and the neckline is finished with the facings that came with the pattern. I found these cute black buttons for fastening. This has been one of my favorite pieces this summer. Simple and fun to wear and feels super comfortable. SHE'S ALIVE!!!! Time has been running away from me like Sonic the Hedgehog recently. How have you been? It's so good to be back! 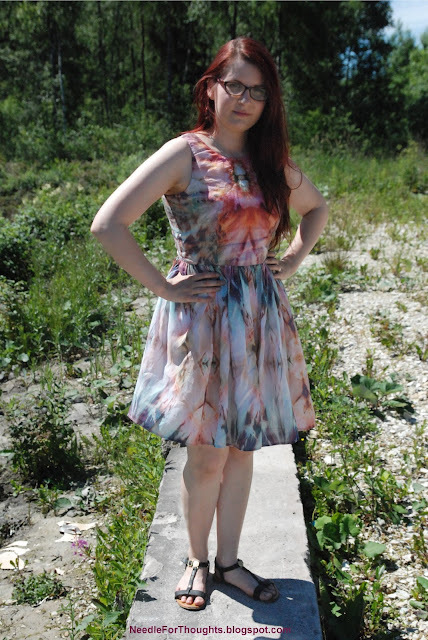 Today I'd like to show you a fun and cool summer dress I made for myself. 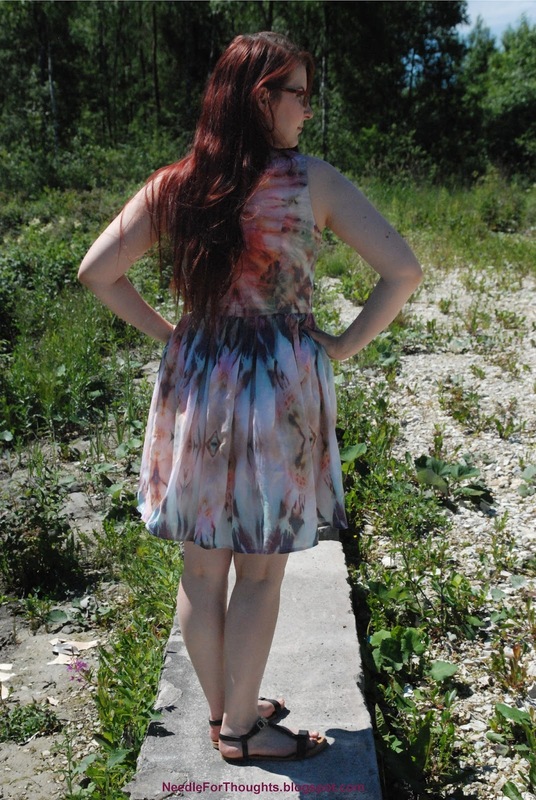 This is a bright linen Clover Dress (pattern by Papercut Patterns). For my version I cut out size S, even though based on my measurements I should have cut size M, but after I looked at the finished measurements, I saw that with the ease S would fit me better. The fabric is a border print linen that I scored from the remnant bin last spring. I decided to place my pattern widthwise instead of lengthwise on the fabric so I could play around with the lovely pattern. One side of the fabric had flowers and other had blurred wide strips of red, black and cream color. Due to not having enough yardage to cut out the dress in full hem width, I slightly reduced the width gradually. I love wearing this dress with a little black belt. The semi loose fit is great for the summer heat and the linen fabric allows my skin to breathe and is nice and cool to wear. While sewing I thought that I might have gone too far with the bright colors and colorblocking but in the end it doesn't even matter it turned out great.